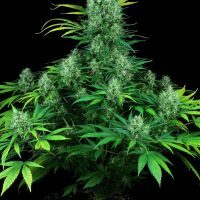 Bubblegum from serious seeds company was the original fruity strain and is still a bestseller today due to its excellent flavour and strength as well as good production levels. Legendary for its bubblegum sweet smell and euphoric high. Bubble Gum grows into a medium tall plant, usually not too branchy (sometimes tall) and produces compact, crystal covered buds. Plants grown from seeds are very similar to one another. Originally the Bubble Gum-strain was developed by growers in Indiana, USA. Later those original genetics came to the Netherlands and were given to two different seed companies. Each created their own ‘original Bubble Gum’ from that genetic material. The Serious Seeds Bubble Gum is more sativa like in looks and effect, a sturdy and strong plant, with the characteristic, sweet smell (truly resembling a typical bubble gum taste) and euphoric high; the original trademarks of this famous strain. The only inbred strain (not a F1 hybrid) on the Serious menu. Bubble Gum has won 10 awards in High Times Cannabis Cups and similar festivals. In 2004 and 2005 it won 5 local and national Cups in Spain alone! In 2006 the Bubble Gum received its best award; it was named ‘Plant of the year’ by magazine ‘Soft Secrets’, because many Spanish growers won in local competitions in that year with the same plant: Bubble Gum.